IT IS REALLY QUITE AMAZING WHAT CAN BE FOUND ON EBAY IF YOU SPEND THE TIME TO LOOK. Amidst the flotsam of junk, fakes and Walmart resellers you find wonderful things. 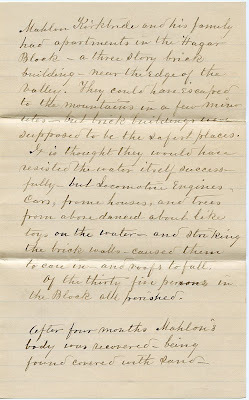 This anonymous letter, a four-page account of the Johnstown flood of 1889 and the death of the entire Kirkbride family, is quite revealing. Over 4,000 people perished in that flood, the result of a dam breaking upstream. Think about it. Just after 4pm on a spring day, as people prepared for dinner and the usual things, death in the form of raging water wiped everything away. This letter should be in the Kirkbride geneology archive. It was once available on eBay (for purchase) for $50 bucks. “Drowned at Johnstown, Pa on the 31st of 5th Mo. 1889 Mahlon Kirkbride, son of Mahlon and Mary Bishop Kirkbride - aged thirty four years and thirty one days, also at the same time his wife Ida V. Kirkbride aged thirty two years. 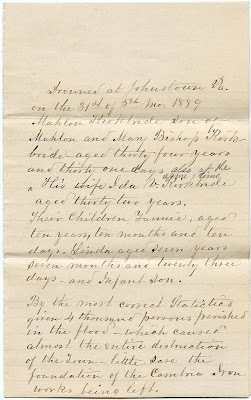 Their children Fannie, aged ten years, ten months and ten days. Linda aged seven years seven months and twenty three days and infant son. By the most correct statistics given 4 thousand persons perished in the flood - which caused almost the entire destruction of the town - little save the foundation of the Cambria Iron Works being left. The flood was caused by the giving way of the dam of an immense reservoir - the largest either natural or artificial in the U. States. The Reservoir was 11 miles east of Johnstown and 2 miles from the village of South Fork. The dam was 2-1/2 miles long and the western end was 4 hundred feet long and eighty feet high. It was originally one of the feeders of the old Pennsylvania Canal. Afterward retained by sporting club as a resort for fishing and boating. After a steady rainfall of 48 hours this dam gave way at a few minutes past four o’clock on the afternoon of the 31st of 5th mo. 1889. In one hour the water had all run out carrying the most fearful destruction before them for 18 miles. Mahlon Kirkbride and his family had apartments in the Hager Block - a three story brick building - near the edge of the valley. They could have escaped to the mountains in a few minutes - but brick buildings were supposed to be the safest places. It is thought they would have resisted the water itself successfully - but locomotive engines, cars, frame houses, and trees from above danced about like toys on the water - and striking the brick walls - caused them to cave in - and roofs to fall. Of the thirty five persons in the block all perished. 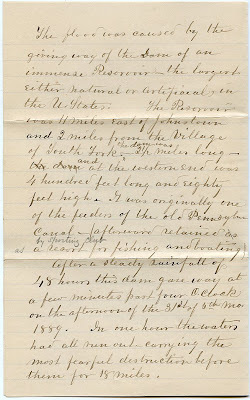 After four months Mahlon’s body was recovered - being found covered with sand and protected by the roots of a large tree on the bank of Stonycreek River - one half mile from his home. His remains were interred on the 4th of 10th mo. 1889- by the side of those of his wife and child in Grand View Cemetery. 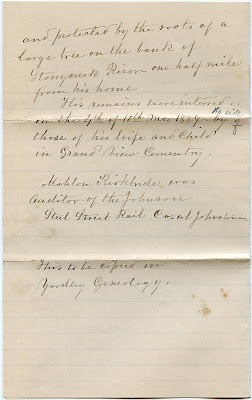 Mahlon Kirkbride was auditor of the Johnson Steel Street Rail Co. at Johnstown. This is to be copied in Yardley Genealogy. 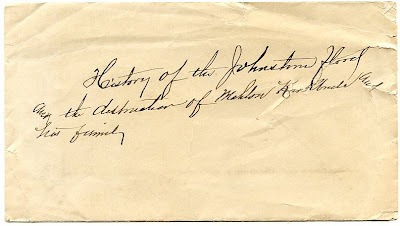 The envelope reads, “History of the Johnstown flood and the destruction of Mahlon Kirkbride and his family”.